You should consider using Apple’s easy-to-use Image Capture. Image Capture can both copy photos off of digital cameras and control a scanner to scan paper documents. Today’s tech tip focuses only on scanning. Image Capture can control hundreds of scanners made by Brother, Canon, Epson, HP and other manufacturers. Image Capture is one of many free applications that comes bundled with every Mac computer. I typically prefer to use Image Capture instead of the scanning applications that come bundled with scanners. In other words, if you already have a scanner connected to your Mac, simply open Image Capture and see if it’s able to communicate with your scanner without doing any additional setup. Turn on or wake up your scanner, but don’t press any other buttons on it. On your Mac, click on the Finder icon on your Dock. Click on the Go menu and select Applications. Locate and then double click on Image Capture to open it. Click on your scanner in either the Devices or Shared section to select it. You might need to wait while your scanner warms up. Look at the picture below to see if your Image Capture looks similar. If not, click the Show Details button to expand the window so it looks like the image below. The right hand side of the Image Capture window lists all of its options for scanning. These are my recommendations if you’re trying to scan one or more pages of text to save them on your Mac or send the file to others. The exact options that you see listed may not be identical to what I mention below or what you see in the picture above. This is because different models of scanners offer different features. Set Resolution to 300 dots per inch (dpi). Leave orientation untouched. You can always rotate the document once it is scanned. Set Scan To to Desktop, so you can easily find the scan afterwards. Type in an appropriate name for your scan. Set Format to PDF since it is the only file type (aka format) that can be multiple pages. Typically, skip over Image Correction. Wait a minute or two for the pages of your document to be scanned and saved. Double-click the file that was placed on your Desktop and admire the results! If you’re interested in additional information about using Image Capture then check out these Image Capture instructions from the Switch To Mac web site and Apple’s own instructions about using Image Capture. 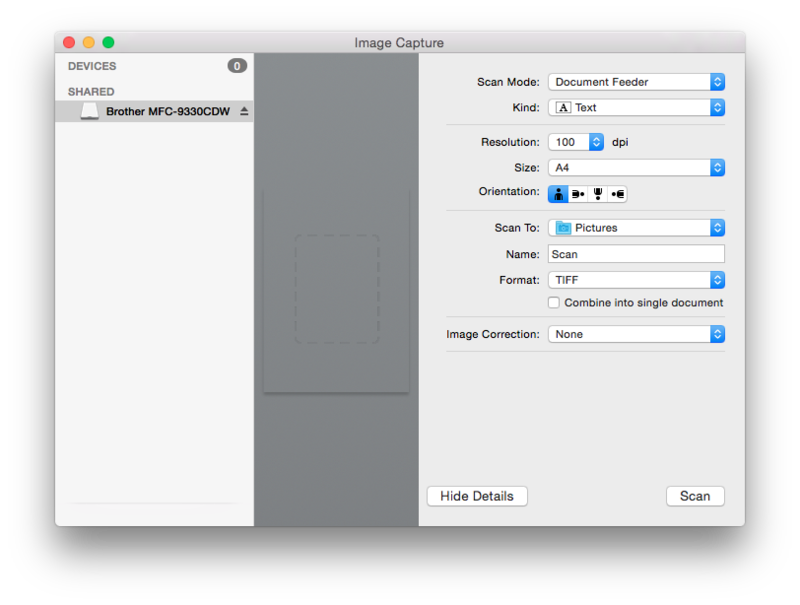 Read more about how to, Image Capture, instructions, mac, scan.